Vision Needs Based Training Game, developed by Breakaway Ltd for Essilor, was selected as finalist in the 2012 Serious Games Showcase & Challenge under the Business Category (Please find also Serious Games Showcase & Challenge 2012 Awards To Be Announced Today). As a finalist, Vision could be experienced at the Serious Games Showcase & Challenge pavilion (booth #3263) at the Interservice/Industry Training Simulation and Education Conference (I/ITSEC) last week. Essilor’s "Serious Game" Training Tool has been under development for the past two years, while being tested with Eye Care Professionals (ECPs) in the U.S., Canada, Europe and Asia. Leveraging on Essilor findings that patients have a higher response rate and greater perception of product value when Eye Care Professionals make recommendations based on their individual interests, needs and lifestyles, Vision gameplay makes possible to effectively elicit patient needs and match them with the best possible solution, in the context of a series of true-to-life scenarios and virtual patient conversations that are applicable in the dispensary environment. The six animated characters introduced by the game, who respond to questions and recommendations made by ECPs, coupled with players’ scores based on their abilities to recognize a patient's issue and recommend proper products, result in a most successful guidance/gameplay/feedback integration based on actual, life-like performance. 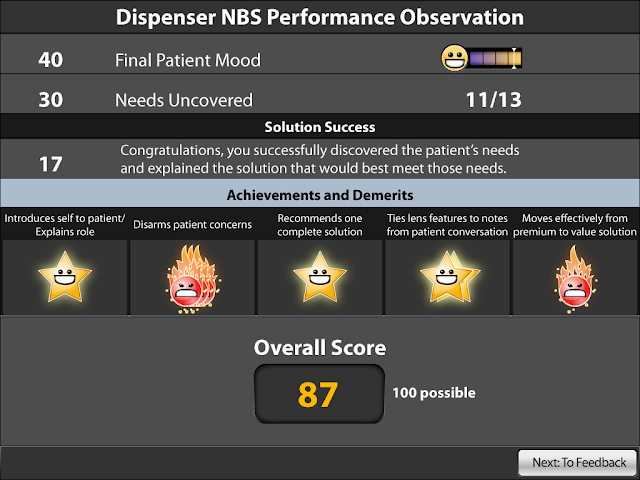 As NBD (Needs Based Dispensing) is taught either in-person or via an e-learning course followed by the live facilitated role play and test component, Vision can easily meet its primary objective of reinforcing and/or replacing the in-person role playing and testing in a fun, immersive and engaging way, thus honoring eye care practitioners' skills.